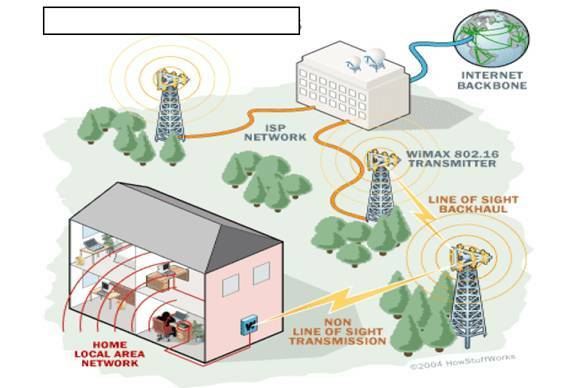 Mobile WiMax is a broadband wireless solution that enables convergence of mobile and fixed broadband networks through a common wide area broadband radio access technology and flexible network architecture. The Mobile WiMax Air Interface adopts Orthogonal Frequency Division Multiple Access (OFDMA) for improved multi-path performance in non line-of-sight environments. Scalable OFDMA (SOFDMA) is introduced in the IEEE 802.16eAmendment to support scalable channel bandwidths from 1.25 to 20 MHz. Release-1 Mobile WiMax profiles will cover 5,7, 8.75, and 10 MHz channel bandwidths for licensed worldwide spectrum allocations in the2.3 GHz, 2.5 GHz, and 3.5 GHz frequency bands. • High Data Rates. The inclusion of MIMO (Multiple Input Multiple Output) antenna techniques along with flexible sub-channelization schemes, Advanced Coding and Modulation all enable the Mobile WiMax technology to support peak DL data rates up to 63Mbps per sector and peak UL data rates up to 28 Mbps per sector in a 10 MHz channel. • Quality of Service (QoS). The fundamental premise of the IEEE 802.16 MAC architecture is QoS. It defines Service Flows which can map to Diff Serv code points that enable end-to end IP based QoS. Additionally, sub channelization schemes provide a flexible mechanism for optimal scheduling of space, frequency and time resources over the air interface on a frame by-frame basis. • Scalability . Despite an increasingly globalize economy, spectrum resources for wireless broadband worldwide are still quite disparate in its allocations. Mobile WiMax technology therefore, is designed to be able to scale to work in different canalizations from 1.25 to 20 MHz to comply with varied worldwide requirements as efforts proceed to achieve spectrum harmonization in the longer term. This also allows diverse economies to realize the multifaceted benefits of the Mobile WiMax technology for their specific geographic needs such as providing affordable internet access in rural settings versus enhancing the capacity of mobile broadband access in metro and suburban areas. • Security. Support for a diverse set of user credentials exists including; SIM/USIM cards, Smart Cards, Digital Certificates, and Username/Password schemes. WiMax must be able to provide a reliable service over long distances to customers using indoor terminals or PC cards (like today's WLAN cards). These requirements, with limited transmit power to comply with health requirements, will limit the link budget. Sub channeling in uplink and smart antennas at the base station has to overcome these constraints. The WiMax system relies on a new radio physical (PHY) layer and appropriate MAC (Media Access Controller) layer to support all demands driven by the target applications. The PHY layer modulation is based on OFDMA, in combination with a centralized MAC layer for optimized resource allocation and support of QoS for different types of services(VoIP, real-time and non real-time services, best effort). The OFDMA PHY layer is well adapted to the NLOS propagation environment in the 2 - 11 GHz frequency range.